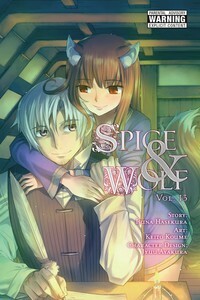 Lawrence and Holo continue to head for the Wise Wolf's homeland of Yoitsu. Even their long, long journey begins to approach its end. On their way, they hear of a mercenary band that carries the name of Holo's old friend, Myuri. As they investigate the group's whereabouts in Lesko, they're astonished by the town's prosperity they find. But what could be the secret hidden beneath the veneer of success...?